This song was built on the crazy idea that if I could include seven differnt rhythms and dance styles into one song it would be fun. As the rhythm changes, so do the dance moves. How we pulled this off is a mystery to me. I loved the children's reaction to Manuel's dance moves, especially since they only imagined him dancing, by lisenting to the song. Theater of the mind . . . 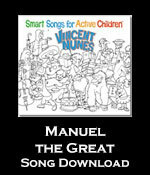 This song is also available on Vincent Nune's full album Smart Songs for Active Children.